For humidity control we highly recommend the Piano Life Saver system (also known as Dampp-Chaser). It is the ideal solution to the humidity problem. The Piano Life Saver humidity control system for pianos provides a consistent climate, keeping the humidity level constant year round in any climate or environment. This device works year-round on grand pianos, baby grands and vertical pianos and keeps the piano at a constant 42% humidity. The system is installed out of sight, inside the piano, silent, easy to care for, and works better than anything else available. A low wattage heater, which comes on when the moisture in the piano is too high, and keeps the piano from getting too damp. 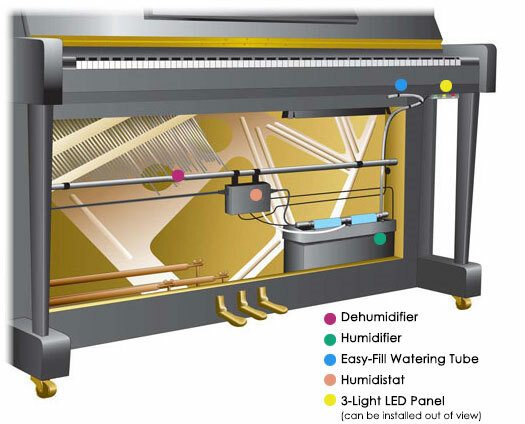 A humidifier, which distributes moisture at the proper amount when the air around the piano becomes too dry. The climate control system is endorsed by piano manufactures, the Piano Technicians Guild, and many experienced technicians throughout the country. This product is the most effective way to care for you piano while saving yourself hundreds of dollars in unnecessary repair and maintenance costs. The Piano Life Saver System will allow your instrument to give you its best in performance and sound for many years to come. Every system comes with a 5-year limited warranty. Visit our online store for Piano Life Saver replacement products & supplies.